The Viewsonic XG3240C isn’t the first monitor we have looked at from this manufacturer, we have previously reviewed Viewsonics XG2703-GS G-Sync monitor. The manufacturer tends to focus on quality and performance over the style, however, the latter doesn’t seem to be lacking on either display. The Viewsonic XG3240C is a 31.5-inch Curved Display with a frameless design. The Curved radius is the usual 1800R and is therefore well adapted to the field of view. The monitor supports resolutions up to 2,560 x 1,440 pixels (QHD) in 16: 9 format and has a refresh rate of 144 Hz with a 4 ms response time (gray-to-gray). It also has AMD FreeSync in the 48 to 144 Hz range which is good news for AMD Radeon GPU and Xbox One owners. The Viewsonic XG3240C boasts a very minimalist design, the frame is essentially non-existent other than the small bar at the bottom sporting a red Viewsonic logo. The stand is fairly wide and sturdy and comes with a cable guide with a red inlay and flip out headset stand built into the rear. One issue I had while using this monitor is that my webcam (the Logitech Brio) came down over the frame and covered a small part of the top of the screen. This won’t affect most gamers, but if you are a streamer or content creator this might be something to consider. 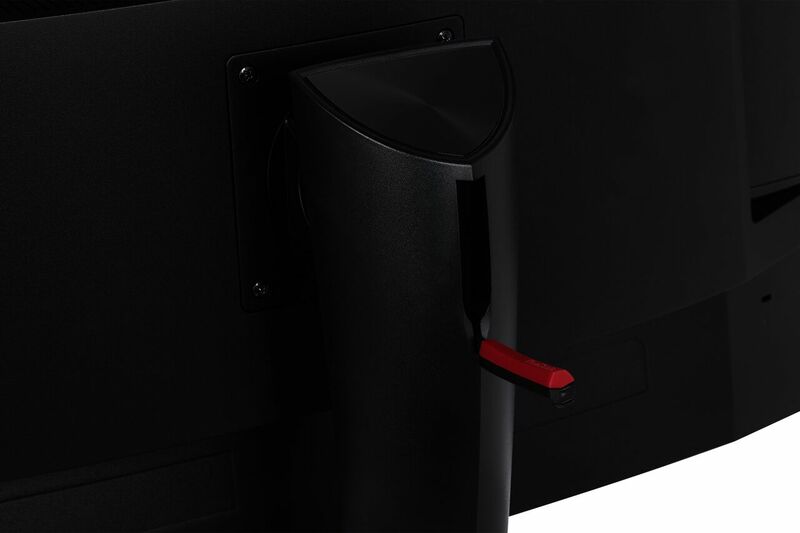 The monitor sports a very aggressive look, especially with the red details that stand out against the matte black. The design is not overdone or over-complicated like many other “gaming” monitors on the market. All of the design choices have performance benefits aside from just the aesthetic. The rear of the monitor comes out quite a bit in the middle section, but this is more of a visual effect caused by the curve of the monitor. There is a vent that runs across the top of the back to allow for cooling. The menu is accessed via a menu joystick conveniently place on the rear-right of the monitor. The base allows height adjustment and inclination as well as the horizontal pivoting of the display. The upright mode (portrait) is evidently not supported but I don’t know why you would want a curved monitor for that in the first place. A retractable hook for suspending a headset is integrated into the stand. The on-screen display (OSD) is operated via a joystick on the back-right of the housing. On the left side of the monitor, there are 2 USB 3.0 ports. These are easily accessible and handy for USB accessories that are frequently changed such as flash drives or charging cables. On the rear of the monitor, we have a few more connection options. For video inputs, we have 2 HDMI 2.0 ports and a 1.4 DisplayPort, while for audio we have a mic input and a headphone output. The monitor also has in-built 5-watt speakers. While they lack the bass required for a good audio experience, they do their job. I would recommend using a pair of external speakers or headphones however. The ViewSonic XG3240C offers a curved VA panel of 31.5 inches (697.344 x 392.256 mm) with LED backlighting and a resolution of 2560 x 1440 pixels (QHD). The monitor has an aspect ratio of 16:9, a curvature of 1800R and most importantly a refresh rate of 144 Hz. This is the main feature many gamers look for in a monitor as it offers optimal performance for their games. The monitor also has a response time of 3 ms (gray-to-gray) which isn’t bad but I would have expected it to be 1ms. It has a dynamic contrast of 3000:1 and a brightness of 300 nits. It also offers HDR10. The flicker-free LED backlight and blue light filter are a welcome feature and are designed to protect your eyes which is handy during long play sessions. One of the features I was a tad disappointed with was the HDR10. I tested the HDR functionality with Assassin’s Creed Odyssey on PC, Battlefield 5 on the Xbox One X and God of War on the PS4 Pro. In each case, once I enabled HDR I ended up with a worse picture. The saturation went way up and many areas of the screen were far brighter than they should have been, making it hard to see parts of the game. This is down to the processing software in the monitor itself and could theoretically be improved with an update. The ViewSonic XG3240C is one of the best gaming monitors that a demanding gamer can find on the market today. The sleek gaming design coupled with high performance creates a monitor that will suit a large number of different gamers without leaving a huge dent in their savings. The curved monitor might not appeal to a lot of people, but the subtle difference the 1800R curve makes while gaming is worth it for those who know what they’re looking for. As well as an enhanced field of view, gamers will also have 31.5 inches of QHD resolution with a 144Hz refresh rate meaning they can take their games to the next level. The ViewSonic XG3240C currently retails for €490 on Amazon. The price is slightly higher than other monitors with similar specifications, but I would see them having a hard time trying to compete with the build quality. If you are looking for a large-format Curved display with 1440p resolution and a 144Hz refresh rate, you can’t go wrong with Viewsonics XG3240C. The monitor boasts great design, simple functionality and great specs and it would look fantastic in any gamers battle station. I would have preferred a 1ms response rate over the 3ms that the monitor has but the difference isn’t really that much. I was fairly disappointed in the HDR10 feature, as a gamer I always want my games to look “better”. It’s not a feature I would make use of for quick-paced competitive games like PLAYERUNKNOWN’S BATTLEGROUNDS or Overwatch but I feel like it could easily transform a single player experience like Assassin’s Creed Odyssey spectacularly. Overall, the main selling point is the high performance and that will satisfy most if not all gamers.